The desk, the mainstay of any given office. Desks started with nothing more than a simple table - a place to sit, read, write, and conduct business. Soon the requirement for storage was obvious, and drawers appeared in the table aprons. 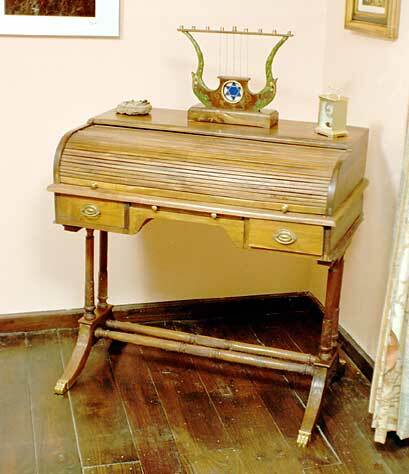 Schools and business clerks were the first to employ desks in large volume, but almost every home of means had a desk for the head of household to conduct his affairs. The summer of 2007 brought us two more gothic commissions, a dining table and a desk. The dining table was completed and delivered in October of 2007 - the desk is now complete and shown above! The New Wave Gothic desk above is in solid quarter sawn white oak featuring our classic gothic tracery panels, also known as piercing or fretwork. 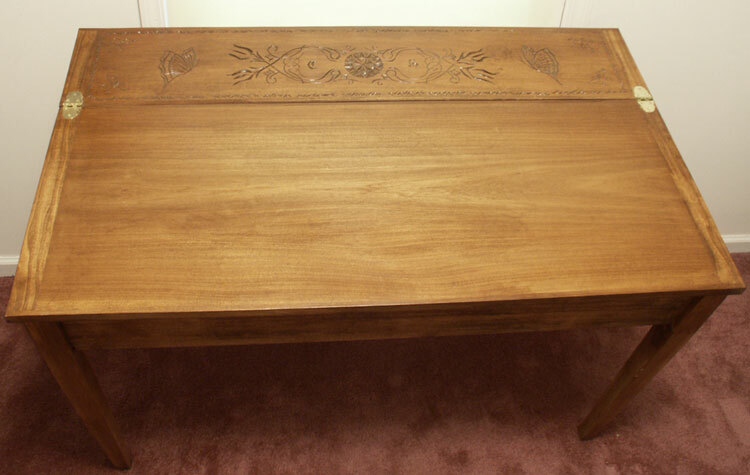 The table edges feature hand carved rope patterns, with corbels and rosettes finishing the ornamentation. This desk fits periods for gothic, tudor, renaissance, medieval, jacobean, or in simplified form a mission or heavy farm style trestle table. We design and build these pieces by custom commission, making size requirements, selection of materials, and stain/finish all options to suit your requirements. Each piece is solid with mortis and tenon joints that are both glued and pegged. We've been told that our gothic pieces would look their best in English brown oak, and yes we can get that as well by special order. 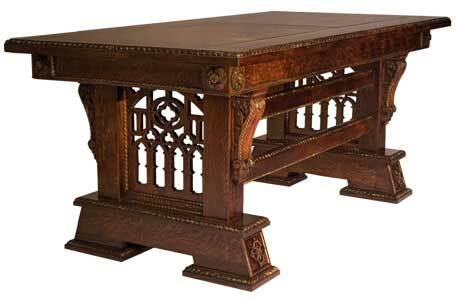 See our Gothic Tables Gallery for more images and details! This custom pine schoolmasters desk features a slant top, extendable writing leaf, a main drawer, and various storage nooks& compartments. An early Stanley piece, if the black and white photos didn't already give you the hint! 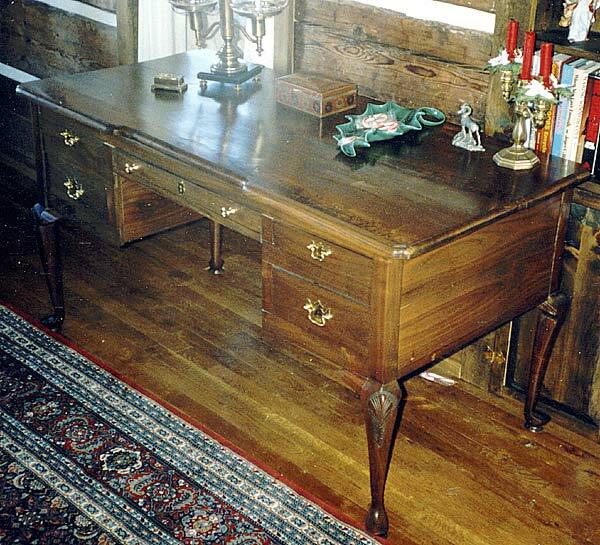 Far more elegant is, shown below, a Queen Anne walnut desk was a project made by Stanley and one of his apprentices, Bill "Charlie" Troutman. 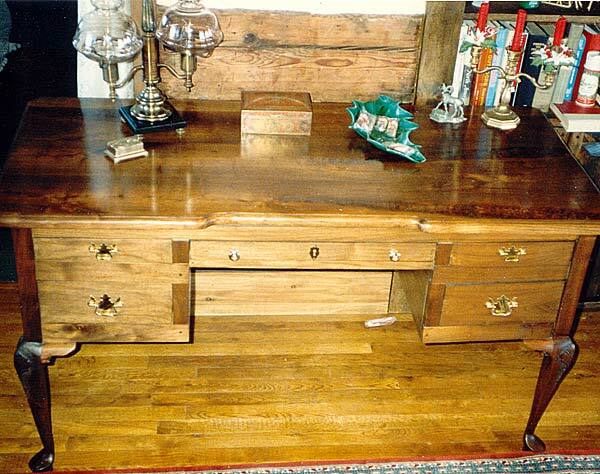 Desks can be made in any size and any material, common to Queen Anne are walnut and mahogany. 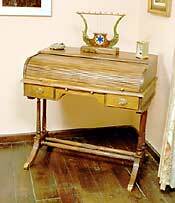 This reproduction of a Duncan Phyfe roll top desk is almost as rare as the circa 1830 original. 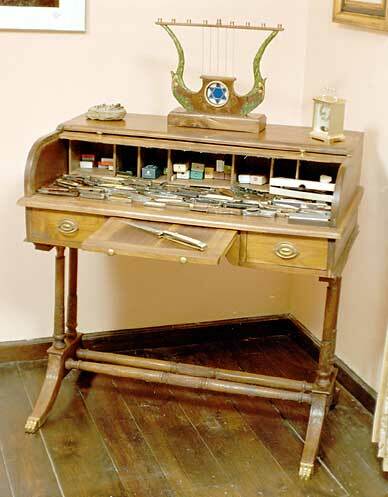 Duncan Phyfe developed the first of the roll top desk line, consisting of a cloth backed grouping of solid wood sticks bound against the cloth. 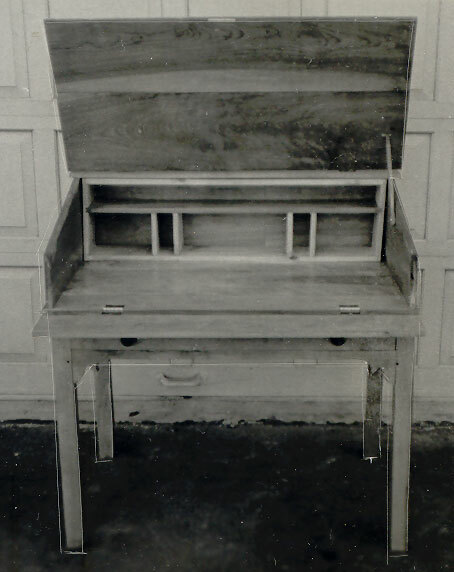 Although it stands in appearance with simplistic elegance, this desk is was one of the most complex pieces completed by Stanley as an example of a Master's work. 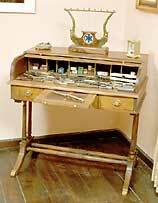 Proudly displaying detailed carving and fluting work on the feet and turned spindle legs in solid walnut. 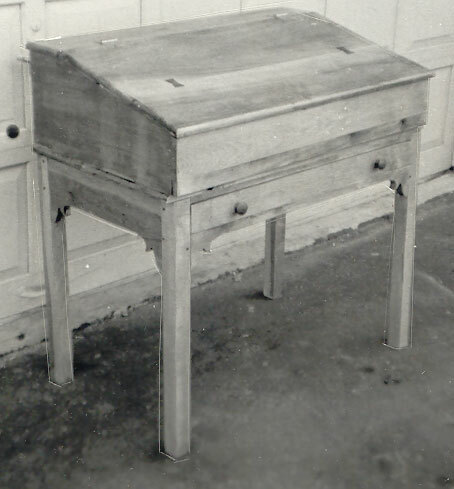 Later enclosed pedestal bases were developed, leaves were employed to extend writing surfaces and leg room from the new form of compacted storage. Encasements were developed to secure the entire desk as one locked unit. A simple style, mission/country combination this flat top poplar desk features a full size lid to conceal the implements of creative writing and a solid mortis and tenon construction. Hand carving ornaments the simple light finished piece, and a mitered banding on the lid provides a finishing touch.